A turbulent six weeks lies ahead as Britain prepares to vote on May 7th. Americans are already in the midst of electioneering, for an election that’s still 22 months away. They can be forgiven a case of envy when they learn that the United Kingdom’s election period will only last 38 days. Elections used to be fairly routine, with either the Conservative or the Labour party winning. In 2010, that changed. Neither party won a majority. David Cameron, the leader of the Conservative Party and Nick Clegg, the leader of the Liberal Democrat Party agreed to form a Coalition government. Later, the two had to agree on austerity measures to get Britain out of the international financial crisis. Today, the country has the fastest growing economy out of all the major western democracies. Austerity seems to have worked better in Britain than elsewhere in Europe. This time, there are a number of parties campaigning to win seats in Britain’s “first past the post” system. The country has 635 constituencies. Whoever gets the biggest number of votes in each of these, is elected to parliament. The leader of the majority faction then becomes prime minister. This time, however, there are more than three parties. The Conservative, Labour and Liberal Democrat parties will all be putting up candidates. In addition, there’s a fairly new party called UKIP (United Kingdom Independence Party), which is campaigning for Britain to withdraw from the EU and to do something about immigration, which many see as out of control. Their leader, Nigel Farage, has already said that if David Cameron, the current prime minister, needs UKIP’s help to form a right-wing coalition government, he will insist on a referendum on Britain’s continued membership of the EU by the end of this year. Mr. Cameron wants to delay it until 2017 when more Europeans will have moved into Britain, making it more likely that a “yes” vote would be returned. Anybody from the EU can vote in referenda, though not in general elections. That requires full citizenship. 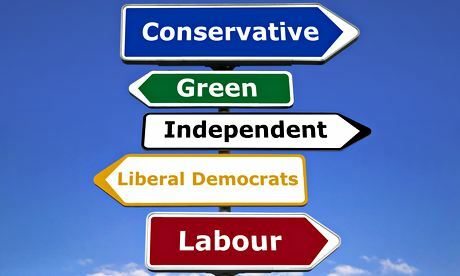 On the left of the political spectrum, for Labour’s Ed Miliband to form a government, he will likely need support from the SNP (Scottish National Party), Plaid Cymru (Welsh nationalists) and even the Greens (environmental party). All of these parties will want government spending to increase, thereby jeopardizing the recovery the present coalition has engineered. There are also smaller parties representing Northern Ireland, which may be needed to form a coalition. It’s all suddenly become very complicated, but the old days of two-party politics seem to be over for good. The next occupant of 10 Downing Street will be the man who can successfully haggle with other party leaders to reach the magic number of 318 – that’s just over 50% of all the seats in parliament, without which governing would be almost impossible.